rose & pine: Sunshine Blogger Award! 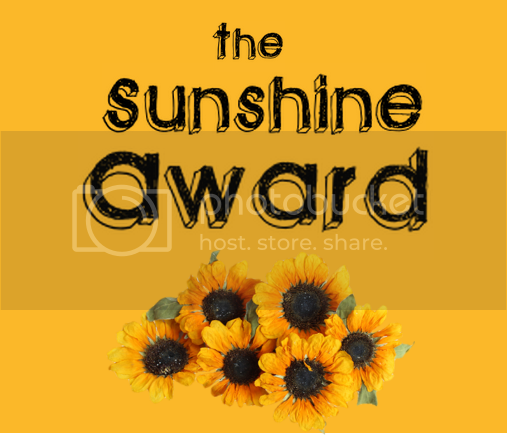 I was nominated for The Sunshine Award by the lovely Vee! It's an award for blogs that make you smile! Rules: Give 11 facts about yourself. Answer 11 questions. Make 11 questions for the people you nominate to answer. Nominate 11 lovely blogs! 1. I have a Netflix addiciton. I am always watching Netflix on my tv or iPad. 2. I hate vanilla ice cream, except for the Newport Creamery's crazy vanilla. I think it's a physiological thing, it's not white so my mind doesn't think of it as vanilla? 3. I watch too many cartoons for someone my age. 4. I also paint my nails way too often. 5. I've seen the Jonas Brothers in concert more times that I should admit. 6. I love consignment shopping, my best finds were a DVF wrap dress from the 90's that fits like a glove and a brand new baby pink cashmere cardigan that I got on the same trip. 7. I'm bad at listing facts. 8. My celebrity crush is Seth MacFarlane. Ohhhh so handsome. 9. My favorite color is pink. I know, boring. 10. While I only started this blog a year ago, I've been blogging for five years now. 11. I stink at giving facts. 1. Are you introspective or are you an extrovert? No, you can't really shorten Paige. Pizza or steak. Totally similar, right? 6. Sweet tooth or sour tooth? 7. Do you like to keep a routine or change things up? 8. What makes you laugh or smile? 1. Put your iTunes on shuffle. What's the first song that plays? 2. Is that song an accurate description of the rest of your music? Or just a random song? 3. Favorite class? If you're no longer in school what was your favorite class? 5. Most worn nail polish color? 6. Favorite weekend night plans? 7. Holy grail make up product? 8. Favorite city that you've visited? 9. What do you like to do when you're sick? 10. What got you into blogging? 11. What color is your shirt right now? I am horrible when it comes to tagging people, I forget to tell them, or I do tell them and then they don't do the tag and I get upset... It's always just a big mess. So instead, I'm going to let you nominate yourself! Comment below with the link because I would love to read your answers!